Lake ice records for Lake Mendota and Lake Monona have been kept since the winter of 1852/53. An oral history of determining ice cover has been passed down within the Wisconsin State Climatology Office. Climatologists today try to follow the tradition to their best ability in an effort to preserve a continuity of lake ice data. To be determined open in the spring, the lakes should maintain less than 50% ice cover. Lake ice tradition states the deepest part of Lake Mendota, which extends from Picnic Point to Maple Bluff, should be clear enough to row a boat across. This rule stems from the era of E. A. Birge, University of Wisconsin President in the early 1900s, and Chancey Juday, pioneer of North American Limnology. The two frequently spent time on Lake Mendota, and the ice between Picnic Point and Maple Bluff determined if they could row a case of beer over to their friends in Maple Bluff. Read more about the history of determining lake ice. Wisconsin Assistant State Climatologist Ed Hopkins discusses how ice cover is determined on our Madison lakes. March 29, 2019. Karin Swanson from Clean Lakes Alliance rode along with Wisconsin Assistant State Climatologist, Ed Hopkins, on Friday, March 29, 2019 to learn about determining ice cover on the lakes. The Wisconsin State Climatology Office makes some initial observations from their office location in the Atmospheric, Oceanic and Space Sciences Building on the UW-Madison campus, but not all of Lakes Mendota and Monona can be seen from the 13th floor vantage point. As a result, additional observations need to be made at a handful of locations near the lakes. The first stop on our lake ice tour was at BB Clarke Beach in Madison. This location has a good vantage point of Lake Monona. It also avoids an area just to the west, which historically had weaker ice due to heated water discharge from the Blount Street Power Plant. From BB Clarke Beach, we looked straight out on Lake Monona and toward Turville Bay. Through our binoculars we could see more than 50% of Lake Monona covered in ice. The second stop on our lake ice journey was near the intersection of South Thornton Avenue and Morrison Street in Madison, where the Yahara River enters Lake Monona. This side of the lake looked much different than what we had seen earlier from BB Clarke Beach. We were able to see plenty of open water on the northeast side of Lake Monona. We were also able to see some birds in the water. Hopkins explained how birds can be a tipoff in determining where open water and ice meet. Even with the open water on the northeast side of Lake Monona, we were still seeing more than 50% ice cover on the entire lake. Panorama of the area where the Yahara River enters Lake Monona. This side of the lake had plenty of open water on March 29, 2019. The third stop on our lake ice tour was on Lake Mendota in Maple Bluff. We saw mostly ice from this location, except for the area near the shore, but the ice was looking very thin. It was dark in color and did not look like good quality ice. Hopkins explained that the ice will break up very quickly if Lake Mendota receives some stronger wind gusts. Wisconsin Assistant State Climatologist, Ed Hopkins, surveys the ice on Lake Mendota from Maple Bluff. March 29, 2019. Our fourth and final stop to determine ice cover was overlooking Lake Mendota on Observatory Drive, directly in front of Washburn Observatory. We could see plenty of ice from our nearly bird’s-eye view. Just like the ice spotted from Maple Bluff, the ice from this vantage point appeared to be low quality and thin. Hopkins determined more than 50% of Lake Mendota was covered as of midday on March 29, 2019. Wisconsin Assistant State Climatologist, Ed Hopkins, observes ice cover on Lake Mendota from Observatory Drive in Madison. March 29, 2019. 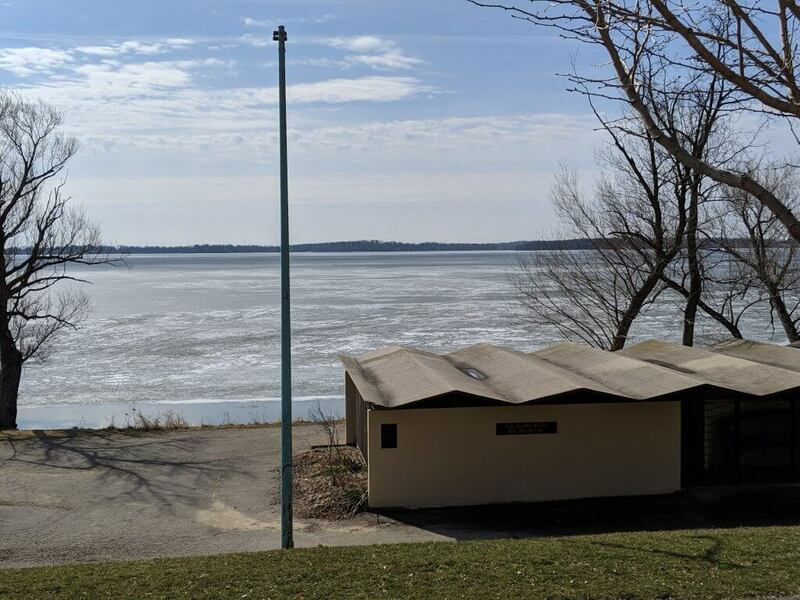 Just two days after our ice cover tour with the Wisconsin Assistant State Climatologist, Lakes Mendota and Monona were declared open for the 2019 season. The poor quality ice we spotted on our March 29th tour broke up quickly in the next two days with winds gusting to 24 mph on March 30th, and 18 mph on March 31st. High temperatures on March 30th and 31st reached the lower 40s, and overnight lows were in the lower 20s. The median “ice out” date for Lake Mendota is April 4th, and for Lake Monona it’s March 30th. Read more about the freezing and thawing of Madison’s lakes.